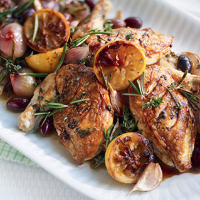 Wonderfully aromatic, this simple one-pan dish makes the most of the great combination of chicken and lemon and creates its own delicious, citrus-scented, winey juices. Preheat the oven to 180°C/gas 4. Season the chicken well and slash the skin in 3 or 4 places. Heat 1 tbsp olive oil in a frying pan and brown the chicken, skin-side down, for 5 minutes over a medium-to-high heat. Transfer the chicken to an oiled roasting pan and add the garlic cloves, shallots, lemons and half the thyme and rosemary. Drizzle with the remaining 2 tbsp oil. Pour on the white wine and 100ml water. Roast for 40 minutes until the chicken is cooked and the shallots and garlic are soft, adding the olives for the last 10 minutes of cooking. To serve, pile everything onto a serving plate and drizzle with the pan juices. Scatter with some extra thyme leaves and rosemary needles, and drizzle over a little extra olive oil and the balsamic vinegar.